The Left & the Leaving centers around the Womack family, a fictional family in equally fictional Pine Creek, a town in (you guessed it!) fictional Cahawba County, Alabama. 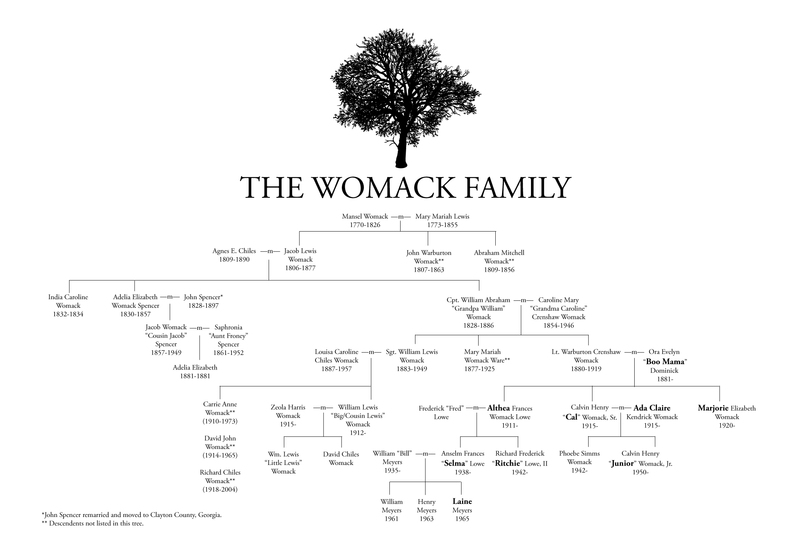 The Womacks are real, though, and this fictional line of Womacks descends from the real-life Womacks that settled in Butler County, Alabama, in the early 1800s. My 5th great grandfather, Mansel Womack, settled on “The Ridge” in Butler County. (According to family legend, his horse slipped on an icy hill, crushing and killing him.) Here’s a snippet describing the Ridge from John Buckner Little’s A History of Butler County Alabama: “Geographically, the whole county is divided by a high ridge into two slopes, or watersheds” (18). This “high ridge of drift soil, with Cedar Creek on the north and Wolf Creek on the south” is “the dividing line of the black prairie land in the county from the common sandy land” (100). It’s on this ridge that my family has lived since the 1800s, and it’s here (albeit fictionally named) that I’ve set my thesis. The Womack-Crenshaw Plantation, photographed in 1935 by the Historic American Buildings Survey. Maria and Miranda, aged twelve and eight years, knew they were young, though they felt they had lived a long time. They had lived not only their own years; but their memories, it seemed to them, began years before they were born, in the lives of the grown-ups around them… (Porter, 4). I’ve lived all of my own life and that of all the generations before me. Through my thesis, I wanted to preserve a sense of this feeling. I wanted my audience to feel as if these people and places were theirs just as much as mine. then, would they still have divorced? or had any children at all? The early stages of my thesis told an alternate reality of my grandparents’ lives. (Which I am honestly so glad I didn’t pursue. It was very meta and would have been so difficult to write. In short, it was a novel told in two side-by-side novellas. Novella A was set in the past, and Novella B was set in the present. As the novel progressed, the reader would discover that Novella A wasn’t actually the past of Novella B, but an alternate reality that still led to similar outcomes. The couple still got a divorce, still died of cancer, etc. etc. It hurts my head to think that I attempted to write that story!) In those early stages, this couple (based on my grandparents) had no children and lived next door to their in-laws. Then Ritchie burst onto the page. Ritchie has been deaf since I first started writing him. I don’t have any deaf family members, and my grandparents didn’t have a deaf nephew, but Ritchie came to life one day after I saw this video about Patrick Otema, a deaf boy in Uganda. From there, the entire narrative changed, and the characters (that were formerly my grandparents) now had this deaf nephew to raise. I knew the nephew had to have a mother, and that’s how Althea (and my great aunt’s influence) began weaving itself into the piece. What if Ritchie’s mother were like my great aunt? What if she left Ritchie with her family and moved to New York? What if this left-behind boy was deaf? How would being deaf in a hearing family, and being left behind by his mother, affect him growing up? I decided the family should be named after a family in my ancestry, but which? Originally, the story was set-up like my own family’s: the son (my grandfather) and daughter-in-law live next door to his parents (my great grandparents) in two houses on a green little hill. Then, my mother and I were talking about how my great grandparents lived with his parents in the early years of their marriage. Now that was a story! What if the son and daughter-in-law lived with his parents in a big, antebellum home? Then, as they struggle to have their own life while living with their in-laws, their niece and nephew come to live in the house, too. Maybe it’s because I love Faulkner, but the idea of that many folks in one old house seemed much more interesting to me than two houses side by side, and it added a layer of tension and depth to the story that changed it in such a phenomenal way. And guess which house my great-grandparents lived in during their early marriage? That’s right: Boo Mama’s house. What if they all lived together in this big house? What if it hadn’t burned? What if the younger couple struggled to have children? What if they are descended from my same Mansel Womack? The big drop off was next, the sharp incline downward, the place where Mama and Boo Mama always pointed out where Mansel Womack died. It was the middle of winter, and the roads were icy and slick, and Mansel was bringing the doctor home to deliver his baby. Mansel’s horse lost its traction on the ice and fell, crushing Mansel beneath its body. But the doctor had the baby to deliver, so he put Mansel over his own horse and led it the rest of the way to the Womack place. When the doctor arrived, he had the slaves put Mansel’s body in a spare bedroom, and he didn’t tell Mary Mariah that her husband was dead until the next morning when the baby was safely delivered. It always made Ritchie nervous going down the hill, even in a truck, even though coming down it meant he was almost home. He hated when Uncle Cal made him take the hill, especially in winter. It wasn’t the leaving—the going up it and away, towards town or another farm. It was the returning, the coming back, the picking his way slowly down the hill on his horse and feeling his heart race the closer he got to the bottom. He hated being made to feel that way when he was drawing near home. It was like feeling sick and hungry at the same time. The Womacks really settled a ridge in Alabama, built homes, and farms, and cemeteries. They lived and died in the same place for generations. So did many of my ancestors, and I wanted to recreate that on the page. Boo Mama’s house was a real place, and she a realy presence in my youth—and though it’s a different Boo Mama in the story, and a different family living in the home, I love that I can bring it back to life through ink on a page.